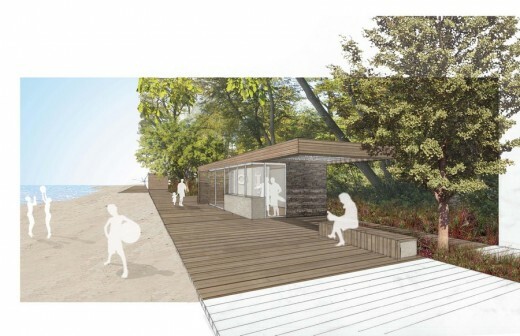 Highland Park’s Rosewood Beach will be reborn this summer as an educational and recreational oasis after an extensive shoreline restoration project and beach infrastructure plan led by Chicago-based Woodhouse Tinucci Architects. 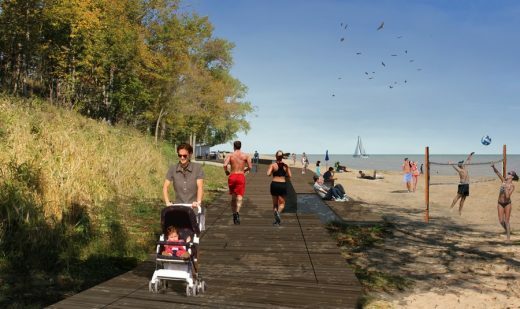 Woodhouse Tinucci Architects was selected to design and oversee the beach infrastructure improvement initiatives after participating in a design competition hosted by the Park District of Highland Park. Woodhouse Tinucci Architects worked alongside the U.S. Army Corps of Engineers and the Park District to develop a plan that took into consideration programmatic needs and environmental stewardship initiatives. 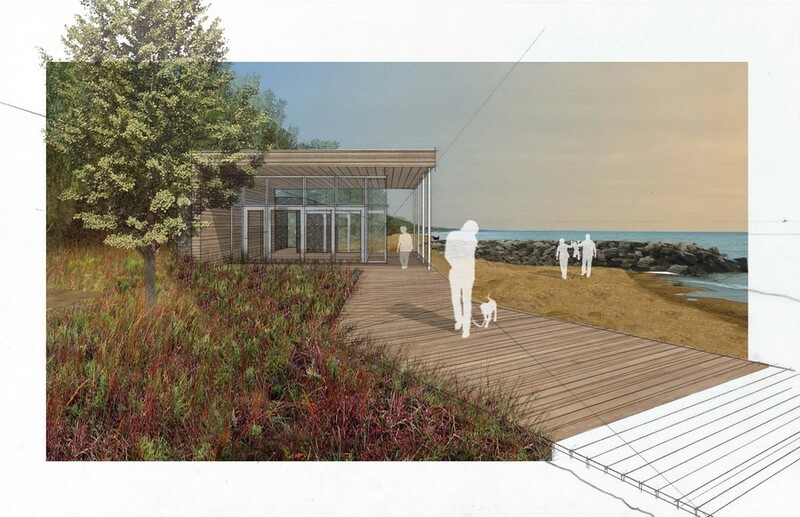 To realize their vision for revitalizing the 17-acre Rosewood Beach and surrounding parkland, Woodhouse Tinucci Architects integrated four unique buildings into a beachfront experience. 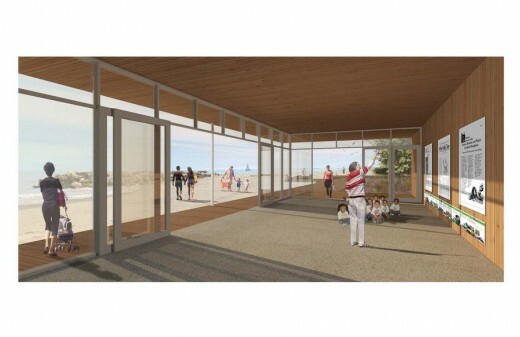 The beachfront is anchored by a 1,500 foot-long boardwalk that leads visitors along the beach, connecting them to the buildings, beach and upper Rosewood Park, perched atop the bluff. This design solution ensured all functions were served without removing any of the valuable beach area between the lake and bluff. The interpretive center, lifeguard station, concessions and restrooms were designed as compact, independent, wood and stone structures that appear to rise out of the boardwalk with a minimalistic design and materials that are natural, simple and sustainable. The shoreline and ecosystem plan called for new low-profile stone breakwaters, extending 200 feet into Lake Michigan. These barriers provide erosion protection to support dune structures and native plantings while creating three separate beach coves that will expand recreational and interpretive opportunities and enable the Park District to simultaneously offer a variety of programming options. Woodhouse Tinucci Architects has completed innovative parkland and lakefront design work for other notable public spaces including the Buckingham Fountain Pavilions, Lincoln Park Zoo, Lincoln Park Conservatory, The Morton Arboretum, Rainbow Beach and DuSable Harbor.